Dr John Grewar presented a workshop hosted by SASVEPM in early May 2014. 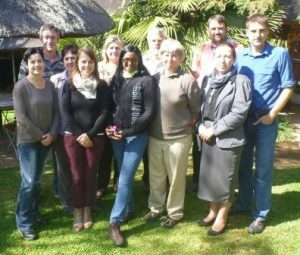 The course focussed on network analysis in veterinary systems and contact tracing during outbreak investigations. Open source software was used (Cytoscape and R/RStudio with various packages including EpiContactTrace) to present to workshop. The focus was on practical ways of evaluating networks in disease and animal systems in order to best make decisions during outbreak investigations, like which farms are most suited to surveillance or which farms present the most risk to a network of farms. The R section of the course introduced the attendees to the EpiContactTrace package which assists in trace back and forwards during disease investigations. Ten SASVEPM members completed the 2 day workshop and hopefully the knowledge gained will be put to good field use in the epidemiology field in South Africa. SASVEPM remain focussed on improving and uplifting the use of epidemiology in the veterinary field in its region of influence.